I recently attended a workshop "Working at Relational Depth", hosted by the Person Centred Approach South West, an association which I am a member of. The workshop was facilitated/held by Professor Mick Cooper who co-authored the excellent Working at Relational Depth in Counselling and Psychotherapy with Dave Mearns. This book was very influential on me during my training. I had some minor struggles with the classic, Carl Rogers' person-centred approach (person-centred being a major influence on my approach) and Mearns and Cooper gave me "permission" to be more progressive in my person-centred-ness. The emphasis is less on being strictly non-directive and more on achieving a deep level of relationship with the client. More about Rogers and the person-centred approach can be found here. I have the deepest respect for what Carl Rogers contributed to the world of psychotherapy. He introduced a humanistic outlook that changed the face of the world of therapy. His seminal books were written in the 50's and 60's and although still very important and influential, it is thanks to the likes of Dave Mearns and Mick Cooper that the person-centred approach has been brought into the 21st century. The book Working at Relational Depth in particular, breathed fresh air and cutting edge perspective into a well-established therapeutic approach. There were also descriptions of changes in perceptions, of time disappearing, differing visual or audio experiences. Martin Buber is a philosopher who focused on deep and meaningful connection in the book "I-Thou". Although the book is short I found it took quite a long time to get through it and really understand the intricacies of the differences in the differing ways of relating, to self and others. Briefly speaking - I/Thou is where two individuals meet with no objectification of the other, in an authentic and open dialogue, experiencing the other rather than evaluating. I/It is the majority of human interaction whereby we apply previous judgements to our encounter. These two differing modes also apply to how we relate to ourselves; I/I being the honest and nonjudgmental accepting of ourselves and I/Me being the evaluating, judging way of relating to self. It was interesting to hear that the non-directivity of the person-centred approach can be perceived by some clients as being cold. If the non-directivity is taken as a dogmatic must, then yes, I can see how a client could feel a lack of holding and care from somebody that doesn't prompt the start of the session with a question, or that provides no guidance whatsoever. Especially at the beginning of the relationship when the client perhaps has no idea what to expect or whether they're "doing it right" (no such thing, by the way). A fascinating discussion also took place here where it was asked whether the client's and therapist's experience of relational depth correlated. I have wondered this right from the start of my training, when we would do practice sessions on other students. A small group of us regularly mused on this and would ask each other if they, as a client, had felt that level of intensity at the same time as us, as a therapist. There often was a correlation but that could because we knew each other so well. What is this intensity? What are we talking about here? Everybody has such a different experience of it, and I shall share some aspects of my experience of feeling very connected with another on whom my attention is focused. Visuals wise, the nearest thing I can compare it to is when during a movie the camera tracks back and zooms in on a person's face at the same time, so the size of the face remains the same but there is an intensity created by this camera technique. One of my peers happened to be experienced in film making so he could tell me that it has a name. You can read more about the Dolly Zoom effect here, and you may have a clearer idea of what I am trying to describe. In the Wikipedia entry it describes the purpose of this trick; "seeing a perspective change without a size change is a highly unsettling effect, often with strong emotional impact". I must add here that I don't find my experience unsettling at all. There are other sensory distortions that I experience that tell me that I am "in the zone". This happens with clients, it happens with my therapist and it happens with loved ones. According to the research that Mick shared with us, there is only a correlation of the perception of relational depth between therapist and client 30% of the time. This surprised me. Is Relational Depth important in the therapeutic relationship? Mick shared that the research on relational depth and the person-centred approach is in it's infancy but that which has been done so far has been well received and correlates well with the research on the therapeutic alliance (which indicates that the therapeutic alliance may be a better predictor of outcome than technique or approach). Effects on the client's process - greater trust, being able to "go back there"
Long term effects - greater self-knowledge, self-acceptance, being "real self", improved relationship with others. I did wonder how this research tied in with the latest in neuroscientific research. I suspect that there would be a correlation. I am thinking specifically here of the book Why Love Matters by Sue Gerhardt (which I briefly reviewed here). Then we looked at disconnection, and had some time to discuss in pairs what having no connections would feel like. My first personal responses were that I would feel bereft, grief-stricken and experience absolute loneliness. Further, that I would rather die and be at one with the universe than be at one with nothing. Interestingly, there were different reactions to this with some people actually finding the prospect quite comforting. Which would be worse? We decided that 1) would be okay, if we were okay in ourselves, and that we could create transitional objects and our own reality. We thought of Tom Hanks in Cast Away and his friend Wilson the volleyball). 2) would be harder - the isolation would be more pronounced than if we were simply on our own. Apparently this is the primary source of psychological distress. Without connection we become nothing. Whom am I? - we become instincts only. Life becomes meaningless, with a lack of direction. However, connection is risky and some take the stance that it is easier and safer to stay disconnected. from this place it is easier to see the disadvantages of connection. Are you getting your 5 a day? How do we make sure we are attaining relational depth with our clients? The issue of self-disclosure came up. I think that a certain amount of self-disclosure is appropriate. I would not engage in a lengthy discussion about myself, but if a client asks me a question about my family or where I'm going on holiday, or if I have ever suffered depression, I do not balk and ask "why is it important to you to know the answer to that question?". I will answer it. I may also enquire as to whether it is helpful for them to know this information and explore around that. Mick referred to our being in the therapeutic relationship as "giving from the core". It's about not being "too po-faced with regards to self-disclosure and refusing to answer". I like this, it sits nicely with my approach of being a human sharing the journey, rather than the expert "doing" therapy to my clients. That is not my understanding of I-Thou (or Thou-I - Mick Cooper's more therapy-centric version of Buber's idyll). Most importantly though, the clients needs to CHOOSE to relate at depth. That is their privilege. What gets in the way of Relational Depth? 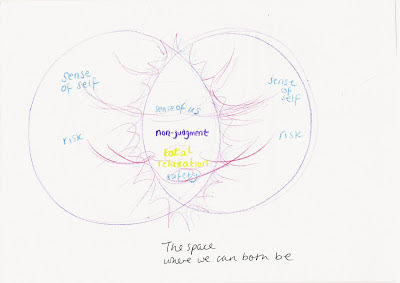 As therapists we were invited to explore what might get in the way of our relating to clients at this level. We looked at our different, individual ways of disconnecting (I tend to shut off my feelings and switch to more cognitive, analytical thinking). Sometimes we may withdraw physically and/or emotionally, hide behind humour or ritual, daydream, attempt to rescue, amongst many other strategies. These are usually subconscious, and, as is the aim in the training we undertake as therapists, bringing awareness to subconscious behaviours makes for better connection, makes for better therapy. The philosophy of pluralism is about acknowledging differing views and opinions. So in the therapy world, this goes deeper than integrative counselling (the type of counselling course which I trained in) because it refers not only to what goes on in the room between therapist and client, but the relationship that the therapist has with the profession. The emphasis, in pluralistic counselling, is "the otherness of the other" as the philosopher Levinas described. This sounds very much like the I-Thou relationship extrapolated. This is about truly valuing uniqueness - everybody grows in different ways. It expands upon the person-centred approach's tenet that non-directivity is the best thing for all clients. Some clients may want or need directivity (especially at the start I would add), and surely this is even more person-centred, than assuming that Carl Rogers' words on how therapy works, will work for everybody. 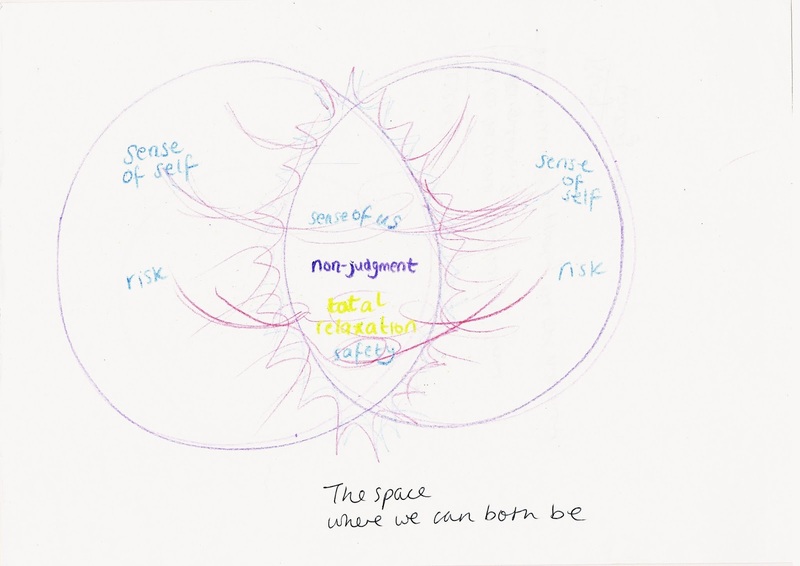 Being person-centred in a truly person-centred way means being flexible, and being able to transcend the black and white dichotomies in the psychotherapy/counselling field, There are lots of different things that can be helpful to clients. If we want to know what it helpful then we can explore it with them. Can we trust our intuition to tell us what a client needs? Try meta-therapeutic dialogue - what does the client want out of therapy? The workshop was a wonderful opportunity for professional and personal growth. Mick was very approachable, down-to-earth and conveyed the concepts and research in an interesting and accessible way. The experiential learning helped etch the concepts into my memory. I was fortunate enough to spend some time chatting with Mick during the lunch hour and I shall share the details on the next blogpost, which is about some research I have done on what the public think about the regulation of counselling and psychotherapy. Excellent work and well written. Thank you for sharing on such an important topic.